Over the years the Kano Foundation has been privileged to witness some magical moments in paradise. From over 6000 ecstatic kids through the turnstiles to ensuring some of the lucky ones get to meet their heroes. 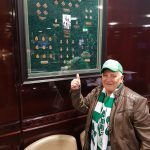 This week we were honoured to have John “The Scarf” Lennon as our guest for his emotional return to Celtic Park after 40 years living in Canada were he help set up the first Canadian CSC. John joined us first for the champions league match V PSG (where even the score couldn’t spoil the occasion) and was completely blown away by the fans rendition of YNWA. 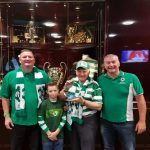 He also joined us for Saturday’s home league match with Ross County, before which, we arranged for him to have a walk down the famous tunnel and into the dug-out area. You can see what this meant to him in our video link https://flic.kr/p/YAWfBY . 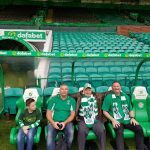 Thank you to the Celtic tour guide Dixie Deans who looked after us on the day. It wasn’t all good news though, as despite doing the half time draw he failed to pull out any of our tickets but we will forgive him this once. 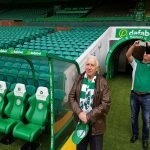 Hail Hail John we hope you enjoyed your time with us.